Is the site currently having security issues? How many security issues has the site had in the trailing 36 months? Are all those security issues recorded in PI (as a Incident-Property or Incident-Employee)? What is the latest property crime rate in the site's neighborhood or zip code? What is the latest violent crime rate in the site's neighborhood or zip code? How safe do residents feel about safety at the site? See Resident Questionnaire Screen, if applicable. The footage from the security cameras should be recorded and stored so it may be accessed in case of an incident. Recorded footage should be stored in cloud based server, and be accessed remotely via mobile or web-enabled device. Resident access into the building should be controlled via card reader or fob. Access to units should be controlled with keys. At a bare minimum, a card reader shall be installed at the primary entrance of each building. Each card reader creates a record of all activity through its designated doorway. Recorded activity should be stored in cloud based server, and be accessed remotely via mobile or web-enabled device. At existing properties the main entrance may be accessed with a keyed system. Unit entries will be accessed with a keyed system. 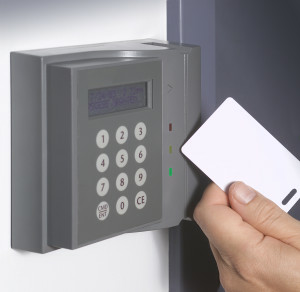 If a card reader system is beyond a property's budget, an improved keyed system can be introduced to the property. The HandyTrac Classic key system is required where a keyed system is used. The HandyTrac Classic is the standard in computerized key control. Connected to the internet, it provides secure automatic backup and audit trail. Accessed via badge and pin, the Classic is easy to use and easy to train staff on. Security comes in a stout 18-gauge steel cabinet, coded keys which are randomly rotated when returned, and data stored on a secure website run on Amazon Cloud. Offered in single and double cabinet options. Guest access into the building should be controlled via intercom. Intercom systems can operate with an external unit and interior unit or with an external unit that calls the unit through a phone line. No system should ring to a cell phone. Builfding codes may dictate whether or not a video intercom is required. Each intercom creates a record of all activity through its designated doorway. Guest access into existing properties will likely be controlled by an intercom. If property has a history of issues due to guest access, the possibility of recording intercom activity should be explored. Recorded activity would enable site management to see when each guest entered the building, and which unit granted their access. where security personnel will be stationed on the property.